The Family of Michael Byrne and Nappy (Penelope ?) Naughton in Mohorra, Shrule Parish. Birth of Michael Byrne: Circa 1789 (From tombstone) place and parents unknown. SMFRC listed Nappy as Penelope, however, there is not a single instance of the name Penelope used in the records from 1831 to 1863. Nappy was a relatively common name in the Shrule records. It rarely, if ever, appeared in the records in Ballinrobe. Occupation: In 1865, at the time of the marriage of his daughter, Nappy Byrne, to Mathias Langan, Michael "Berren" (Byrne) was described as a "poor tenant". Children: They did not appear to have had children. SMFRC listed Peter is the "presumed son of Michael and Penelope". He was listed on the Byrne Family tombstone as the "brother-in-law", of Mary Byrne, the wife of Thomas Byrne. Thomas Byrne was the son of Michael and Penelope Byrne. Thomas Byrne was the landholder of the property where Peter lived in both the 1901 and 1911 census. If Peter is presumed to have been older than Thomas, what are the issues that Thomas became the landholder and Peter didn' t ? Since Peter's baptism was not recorded, there is the possibility that he was born before 1831. It is also possible that Peter was not the son of Penelope but was the son of Michael by another marriage. The first person listed on the Byrne Family Tombstone was Mary Byrne, the wife of Thomas Byrne. Peter was listed as "her brother-in-law, Peter Byrne, died August 1917". Death: Another Margaret was baptized in 1844. Note: The Byrne Family Tombstone lists, "Mary Byrne died 21th July 1899, aged 65 years". This is either this child, baptized as "Margaret" or possibly another child born to Michael and Nappy. Death: Another Nappy was baptized in 1836. Mathew (sic) Langan, age 21, bachelor, profession, labourer, residence at the time of marriage, Ballinrobe, father, Mathais Langan, poor tenant , married Penelope Berren (sic), age 22, spinster, profession, labourer, residence at time of marriage, Tubbersharre, daughter of Michael Berrin(sic), poor tenant on June I, 1865 in the Roman Catholic Chapel of Shrule, District of Cong, Union of Ballinrobe, County of Mayo, Ireland. The witnesses were Thomas Berren (sic) and Saragh Burke. Who was Sarah Burke? There is no record of a Sarah Burke born in Shrule parish. There is no record of a Sarah married to a Burke in Shrule parish. Was Sarah born a Burke or married a Burke? Children: Nappy Byrne and Mathias Langan had five children: Pat, Martin, Maggie (Margaret), James, and Bridget. All of the Langans, including Nappy and Mathias, immigrated to New York City in the late 1880s. The children all married and had children of their own. Baptism: John of Thomas Byrne and Mary Biggins, sponsors: John Naughton and Penelope Byrne, July 1, 1873 Tubbersharive. Baptismal record from www.shrule.com sponsors from SMFRC. This is the only record I could find for John Naughton. See Naughtons now or at the bottom of he page. Other Records: Margaret Byrne immigrated to NYC in 1897cand returned to Ireland several times: 1905, 1924, 1936. 1897: Margaret Byrne, age 21, servant, Ballinrobe, destination New York, 1 bag from Queenstown on the Teutonic June 09, 1897. 1901 Census in Ireland: She was not listed in either the 1901 or 1911 censuses in Mohorra. 1902: Margaret Byrne was the godmother for Joseph the son of Joseph Walsh and Maggie Langan in 1902 in NYC. Peter Byrne age 25, clerk, born Ireland, Shrule, destination New York, "home" in NYC 1535 2nd Avenue. Note The person next to them was, Julia Walsh, 44 widow, Kilmane Ballinrobe destination Brooklyn, "Home" at 283 Carroll Street Brooklyn. Her name was crossed out because she missed the boat. She entered on Sept. 15. she was listed in the 1910 census as a servant at 283 Carroll Street. Mary Huddy immigrated June 9, 1897, from Queenstown through Ellis Island, on the Teutonic, age 18, servant, from Ballinrobe, to New York. Mary Flynn, age 22, and Mary Flynn, age 28, both servants from Newport, cousins, no destination, May 6, 1900 from Queenstown on the Etruria. Patrick Reilly, age 23, labourer, last residence Headford, mother, Margaret Reilly, Mocarra, Shrule, Co. Mayo, to brother, James Mechanicsville, New York, 5' 7'', dark complexion, brown hair, blue eyes, traveling with Sarah Higgons, age 19, labourer, mother Margaret of Di---ffard, Shrule, Co. Mayo, to sister Mrs. ____ ich, 208, East 38th Street, NY, 5' 7", fair, red hair blue eyes from Queenstown May 27, 1908 on the Oceanic. There are several posibilities. This one fits the best; matching both her age and date of immigration. Margaret Byrne at E 77th Street near 5th Ave., Manhattan, with the family of Charles Payne, vic president tobacco, his with and 4 children. There were 5 servants including 3 maids, a cook, a butler and a nurse. Margaret Byrne age 45 Single, born Ireland, immigrated 1897, Alien. 1936: Byrne, Margaret age 58, F. s., USP 303 041 Wash DC 6/5/36 naturalized Supreme Court New York 1923 address 1145- 3rd ave., New York on the Sat Louis from Galway arriving New York 15th Sept 1936. Return to Ireland: After 1936. 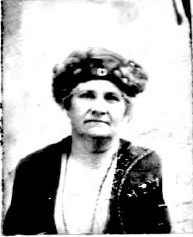 Margaret Byrne from her 1924 passport application. Baptism: No record in Shrule parish. Close birth of Margaret above. Return to Ireland and Reentry into US: 1905. See Margaret above. 1905: Naturalization - Byrne, Peter US District court Brooklyn, June 15, 1905, vol. 69 36 Hudson Ave., Brooklyn, accupation R. r. Guard, birth April 3, 1879, fromer nationality English, date of arrival June 2, 1899, Patrick Murray 36 Hudson avenue, Brooklyn. Petition: Peter Byrne, Rail road guard, June 15, 1905, witness Patrick Murray, 36 Hudson avenue retired disabled by age rail road guard has know Peter Bryne since 1899 - Peter Byren bornn Ireland, 3 April 1879 immigrated June 2, 1899, residence 36 Hudson avenue, Brooklyn, - he signed. 1910 Census: Listed with Margaret in 1910. Not listed with Margaret in 1920 census. No marriage for Michael Reilly at Shrule.com. There were two baptisms of children born to Michael Reilly and Margaret Reilly of Tubbersharive: Michael in June 1882 and Michael in March 1887. However, since there were Reillys in Mohorra it seems more likely that she may have been related to these Reillys and her baptism was unrecorded. Death of Mary Byrne: July 24th, 1917. Listed on the Byrne Family tombstone as the "daughter-in-law" of Mary Byrne. Note: Thomas Byrne was also listed on both the 1901 and 1911 censuses as the landlord for his bother, Peter Byrne. Mary Byrne was the first person listed on the front of the Byrne Family tombstone. "In loving memory of Mary Byrne (Woodpark) who died 24th July 1916"
Griffith Changes: Nappy Byrne (1856 and book 2) #2 a in the Griffith. Nappy Byrne (book 2). Nappy Byrne in book 3 (1860-1861 ish). Nappy Byrne in book 4 (1863-1864 ish). Nappy Byrne in book 5 (1865 ish). Thomas Byrne in 1879 (book 6). Thomas Byrne in book 7 (1883-1897). Note: I do not know who Sally Joyce was. There was no listing in the Griffith for Joyce in Mochara. Joyce was not a name of any of the sponcors of the children of Nappy and Michael Byrne or of the children of their son, Thomas. Byrne Family Tombstone: "Nappy Byrne died 6th November 1878, aged 65 years"
Michael Byrne, son, Roman Catholic, can read and write, age 23, farmer's son, not married, born Co. Mayo, Irish & English speaker. The census indicates that Thomas Byrne and family were living in a 3rd class, 2 window, 3 room house with 3 outbuildings: cow house, piggery and barn. Since the Langans appear to have been living with the Byrnes in 1875 and the number of buildings in the village did not change from 1865, this was surely the same house where Maggie Langan Walsh was born. How strange it must have been to come to a walk up appartment in New York City. Peter Byrne, head of house hold, age 70, Roman Catholic, cannot read, farmer, widower, born Co. Mayo, Irish & English speaker. I would assume that Mary Naughton Connell and her husband, James, stood in line to inherit the land. The first pages of the 1911 census forms listed everyone in the townland. There is a column on these pages for the name of the landlord. Every entry, except two, have a line drawn through the landlord space. One of these two entries listed Thomas Byrne as the landlord of Peter Byrne. The census indicates that the Byrnes were living in a 3 window, 2nd class house. The exact number of rooms cannot be determined from the census information.This shows an increase of one window and a class improvement from 3rd to 2nd between 1901 and 1911. 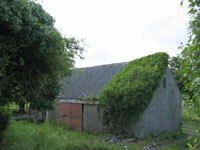 They also had an increase in out buildings having added a stable and fowl house. Shrule Parish baptisms and marriages (no deaths) from 1831 to 1863 (with a break of several years in the 1850s) on microfilm through the Church of Jesus Christ of the Latter Day Saints. South Mayo Family Research Centre (SMFRC). The Byrne Family tombstone in Shrule Parish. "Byrne (O) Byrne, "O' Broin (bran, raven). A foremost sept in east Leinster, prominent in Irish history, especially in the resistance to English conquest. Byrne is now one of the most numerous names in Ireland." The O'Byrnes were decendents of Bran (Broen), King of Leinster, who died in 1052. The O'Byrnes were famous in Ireland for their resistance to English aggression. They continued to elect chiefs of the sept (ancient Irish clans) until the end of the sixteenth century and were prominent in the 1798 insurrection. The name is less common in the west than in the area around Dublin. Naughton, Naghten, Nocton, and Norton are derived from Neachtain, a personal name. "Naughton O Neachtain. (Neachtain, a well-known personal name, may derive from the word meaning bright or pure) There are two septs of this name in the west. There are several variants including Nocton, Knochton, and Natton and the English name Norton is also used. Penelope is listed as the Anglicized version of the Irish Finola, Finnguala, Fionnghuala, Fionnuala, pronounced (f'un-ual-a), meaning "fair shouldered". Donnchadh O'Corrain in Irish Names says that the name was "extremely popular in Ireland in the later middle ages especially among the O Connors of Connacht, the O Briens, the Mac Dermotts and other families". He says that Finnguala has not been popular since the 1700s, but that the form Nuala is still popular. Nicknames are Penny and Nappy. "Nappy Byrne" on the baptismal record of her son, Pat, in 1866. "Penelopa" in the baptismal record of her daughter, Bridget, in 1879. Variations of names in the records are a common occurrence, but Nappy's are more varied than usual. To see photos of the Byrne Tombstone in Shrule Parish, click on the tombstone.